In 2010, Suzanne was presented with a Civilian Medal by the Military for her services to veterans. 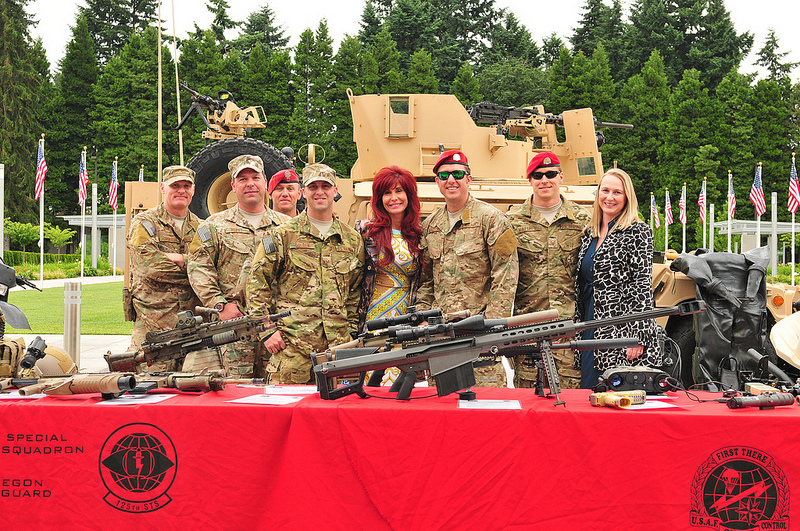 Producer Suzanne DeLaurentiis returned to Oregon on March 9th to show her continued support for the Oregon National Guard and the Reintegration Team. This isn't a glamorous, high profile event by any stretch of the imagination; people like Suzanne do this because it holds a special place in their hearts, as well it should. Our Veteran's return from horrors that most of us don't even want to imagine and are then put in a position where they have to put their lives back together. These are men and women who put their lives on the line every day that they are in the service, and when they come home, they can't even get a job. Does this sound right? Does this sound like something that should be occurring in our great Country? Absolutely not, and perhaps if more people were aware of the struggles that our brave men and women go through when (if) they return, it wouldn't. This is where Suzanne DeLaurentiis comes in to the picture. 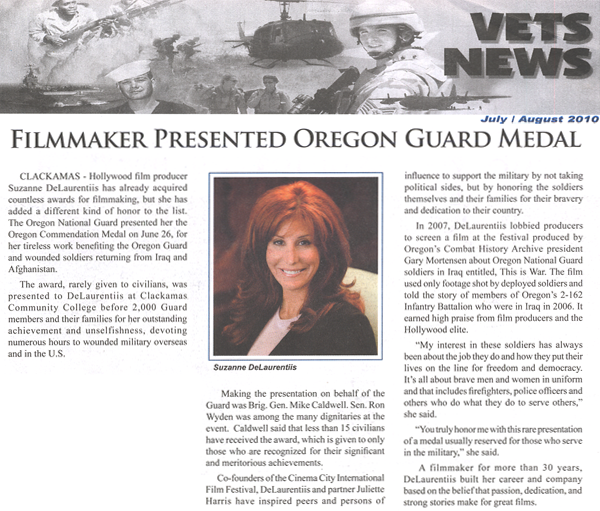 When she first heard about the Oregon National Guard and theReintegration Team, spearheaded by Master Sgt. Vinnie Jaques, she knew that she had to get involved, and she has been ever since. She's hosted numerous charity events for the Organization, and is constantly reaching out to her Hollywood colleagues both for donations and to spread the word about the lives our Veterans are coming back to. In a lot of ways, that seems to be the easy part. This past Friday and Saturday, Suzanne went to Salem, Oregon and was presented for the second time with the Oregon Commendation Plaque, a true honor, and one that she doesn't take lightly. If you walk into the typical Producer's office in Hollywood, the first thing you're most likely to see are recent posters of movies that they've made or an award from the industry. The first thing you see when you walk into Suzanne's office is her accommodation medal from the Oregon National Guard. "I make movies, and the men and women of our military make it possible for me to do what I do for a living. In the grand scheme of things, I think it's obvious which one of us has the most harder job." Agreed, but Suzanne's charity work, even when it involves getting an award, is far from easy. In fact, it's downright heart wrenching. See, Ms. DeLaurentiis doesn't ever just do one thing. She's got drive, and one of the common traits of people with such drive is the ability to multitask. In other words, it was never on Suzanne's agenda to go to Salem justto receive an award. She went out in less than stellar weather conditions to the tarmac to see Captain Tyler Eikenberry, commander of 7-158 Aviation, to see him off on his mission to Afghanistan. Watching him board the Blackhawk Helicopter was a particularly moving event for Ms. DeLaurentiis. "I can never quite comprehend the selflessness of our soldiers. It's something you never get used to." Lt. Col. John Middaugh, the new commander of the 1249th Engineers, said, "Her presence here was great! She made a lot of effort to come here and that was something special--besides the financial support, I think the symbolic gesture was great too; what she did was very clear to the troops and they sincerely appreciated it." Yes, the financial support is much needed, but so is something that money can't buy: a shoulder to cry on or somebody who is just willing to listen. More than anything, that's what this trip was about – Ms. DeLaurentiis just being there for the troops in whatever capacity they needed. If they wanted to talk about their fears about combat, Suzanne listened. If they wanted to talk about coming home and trying to readjust, Suzanne offered advice. If they just wanted that shoulder to cry on, she was that too. Suzanne was honored to be doing this for our servicemen and women, but at the end of the day, she was the one being given praise and recognition. "It breaks my heart. Some of these men and women won't be coming home. They are the ones who deserve all of the praise and recognition." Her reaction to this honor gave all attendees a glimpse into her heart: she was the one crying now.